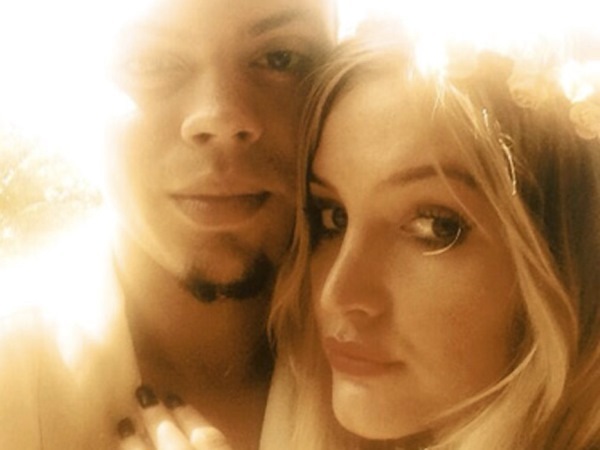 Ashlee Simpson is engaged to Evan Ross, after her proposed during a New Year's trip to Hawaii. The singer's boyfriend, Evan Ross, proposed on a New Year's trip to Hawaii and she is ecstatic to be getting married. Alongside a picture of her showing off her ring with Evan on Twitter, she wrote: "My baby love and I are ENGAGED!!! Hallelujah Hawaii !!!!! (sic)"
Evan also tweeted, saying: "The love of my life said YES!!!!!! (sic)"
The couple first announced they were dating in June last year and by November Evan (25) was hinting he would like to marry Ashlee. He said: "She's the one. I'm so in love and we've got amazing things going on. And we inspire each other." Ashlee (29) is also said to get on really well with Evan's mother, singer Diana Ross. A source who saw all three of them together at a movie premiere in New York City last October said: "Diana kept talking over and around Evan to Ashlee, laughing and chatting and they seemed very close. Diana and Ashlee seemed to get along so well and Evan and Ashlee held hands while they spoke to Diana before the movie started." Ashlee will be walking down the aisle for the second time with Evan, after she was previously wed to Fall Out Bay musician Pete Wentz - with whom she has five-year-old son Bronx Mowgli - from 2008 to 2011.